Wale "Nike Boots" video (Directed by Chris Robinson) from Life After Midnight on Vimeo. 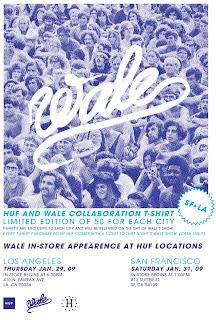 Huf has teamed up with recording artist Wales for a limited run of tees to commemorate the SF and LA shows. Prior to each show Wales will be making an in store appearance at the respective Huf locations. Get there early to reserve your tee (limited to 50 piece for each show). LA goes this Thursday (tomorrow) and SF Saturday.